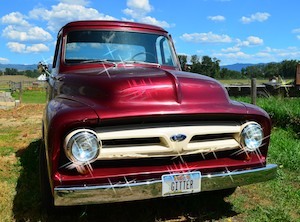 Mid-July – After enjoying some ranching and quilting fun in Montana’s Bitterroot Valley, we strolled the cute town of Hamilton where there is a high-end, ambiance-rich, specialty coffee bistro on every corner. Our kind of town! Wandering down one street, Mark noticed a guitar shop, and just had to stop in. 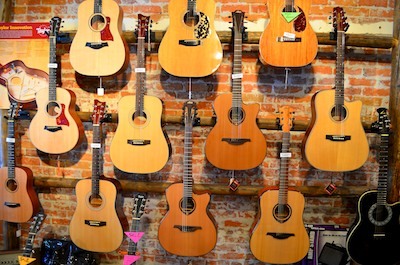 We got chatting with Cody, the young owner who, together with his wife Nichole, has taught guitar since they were in their early twenties and had recently purchased the store, Mountain Music Learning Center. The wall was lined with Taylor and Takamine acoustic guitars, both of which Mark has owned and liked. But tucked in among them were another brand, BitterSweet Guitars. “I make those,” a voice said behind me. Our eyes popped open as we turned to see a friendly looking fellow with a mustache. Really? 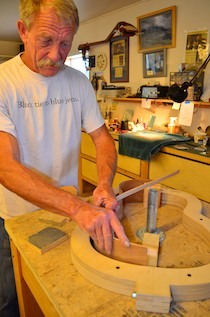 Hand-made guitars and the builder right here on a stool at the counter?? His name was Ken Rumbaugh, and it turned out his workshop was just outside of town. 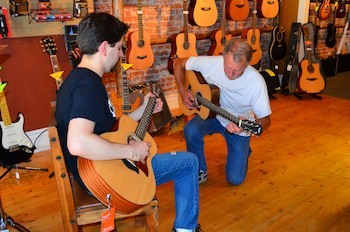 He took a guitar down off the wall, strummed a few chords, and then began jamming with store owner Cody. What fun! Next thing we knew, Ken was inviting us to come see his workshop. What an opportunity!! A few hours later our buggy rattled down some narrow lanes as we followed Ken’s directions. The pretty Bitterroot mountains made a picturesque backdrop in the distance across farm fields. 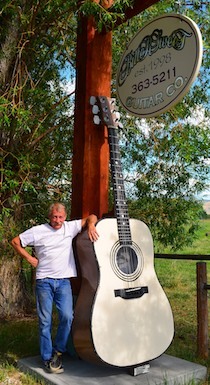 Then there it was, the ten foot tall playable guitar Ken had built as BitterSweet Guitar’s sign. 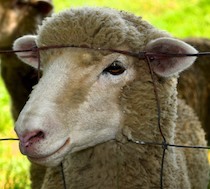 Hopping out of the truck, the first thing we noticed after the enormous guitar was a cool ancient truck parked out back and a nosy sheep that stuck his head through the fence to have a look at us. As Ken led us into the workshop we passed a large bank of Outback solar charge controllers. The shop was powered primarily by solar power! But like all of us who live with solar power, there were limits. 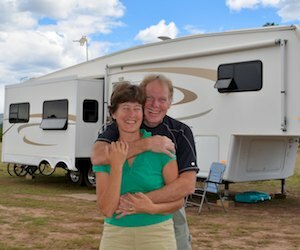 Our fifth wheel’s 490 watts gives us everything we need in the buggy except air conditioning. Ken’s 5,000 watts in his workshop gives him everything he needs but his big air compressor… This was the second commercial building we had seen using banks of Outback controllers (the first was the NOLS school in the Sea of Cortez). The BitterSweet Guitar workshop was filled with a wonderful array of sweet smelling wood and sawdust, impressive power tools, and instruments in various stages of completion and repair. 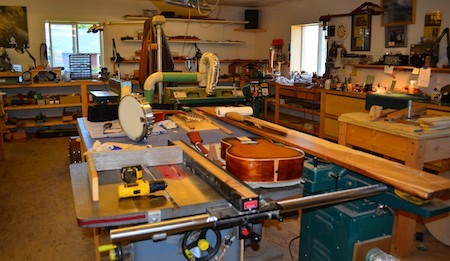 Along with building guitars, Ken repairs stringed instruments of all kinds. 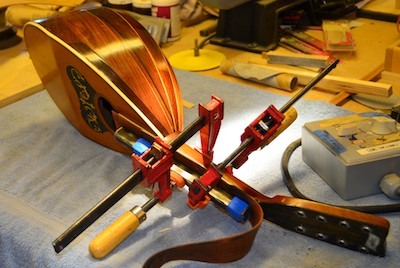 Throughout our tour he kept returning to a lovely “tater bug” mandolin, whose neck was in clamps, to check on it, as it needed to move on to its next phase of repair once the glue had been at a certain temperature for four hours. 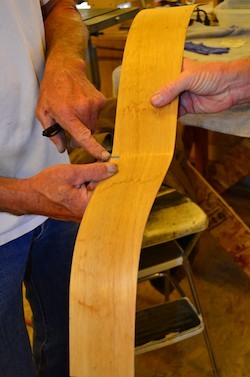 Ken walked us through every step of building a guitar, from selecting and shaping the wood for the sides to creating the neck and headstock to attaching the front and back. Who knew that every guitar’s front panel is rounded as if it were part of the skin of a 32′ diameter ball? 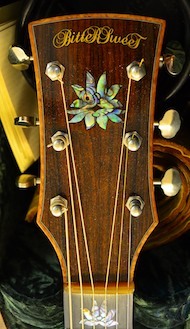 He showed us a BitterSweet Guitar headstock inlaid with beautiful, iridescent, abalone pieces in the shape of a flower. Each guitar was crafted with carefully matched wood patterns, and he spoke warmly of his customers who each come to him with very particular requests for their instruments. Guitars emerging from this shop are works of art. Ken learned his craft as a young man, hanging around the Martin factory that was near his home in New Jersey. The workers were happy to share tips with him, and he dumpster dove behind the factory to pick up and study their cast off necks, bridges and headstocks. Having sold his cabinet-making business after many years, he now builds guitars as a fun retirement job. What a satisfying skill to have. A few days later we met up with Ken once again at the Hamilton Farmer’s Market. 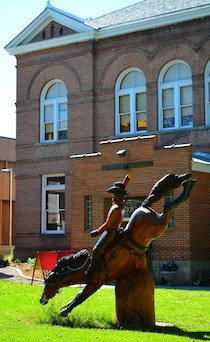 This is a lively summer Saturday morning event, and Ken, along with his bandmates, made wonderful music on the green in front of the county courthouse where there is a marvelous wooden statue of a rodeo bronco. 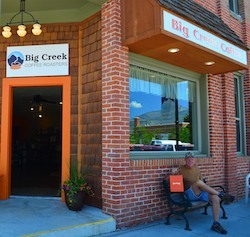 We hung around the Bitterroot Valley area a while longer, and returned to the Mountain Music Learning Center guitar shop briefly so Mark could learn the opening strains of a song shop-owner Cody had played so easily when we were first there (White Lion’s “When the Children Cry”). And eventually we moseyed down to the small town of Darby, MT, where we found a unique library and ended up behind bars. Did you enjoy this? Subscribe to our News Feed! !